From the Boss, PLEASE SEE ME: Get to work a few minutes early (before co-workers get settled at their desks). Write PLEASE SEE ME in bold, capital letters on some sticky notes / Post-Its, and sign with the name of the most senior person in your office (who might have a reason to be upset with one of your co-workers). Stick them on a few co-workers' computer screens. Out of paper : this one is perfect for someone who's just clueless about technology. Tell the person that another department (or location) is out of copier paper and that you need him/her to fax a few blank pages to them, just enough to hold them until their paper shipment arrives. This would be perfect if faxing stuff is already a part of the person's daily routine/tasks, so it won't seem like a particularly unusual request. Fake email notice about a burst of concentrated air: If you manage an office mailing list or work in the I.T. department (recognized name), you might be able to pull this one off. Send out an email notice to all staff, announcing that the phone company needs to clean the built-up dust out of the phone lines and that everyone should unplug their phones because a burst of concentrated air will be sent through the phone lines at a certain time, and that if the phone is not unplugged, the cubicle will fill with dust. You won lots of money: pretend you just won a ton load of money while playing at an online casino, then flip the bird at all your co-workers and supervisor while telling them you're 'glad I can finally ditch this sorry joint'. 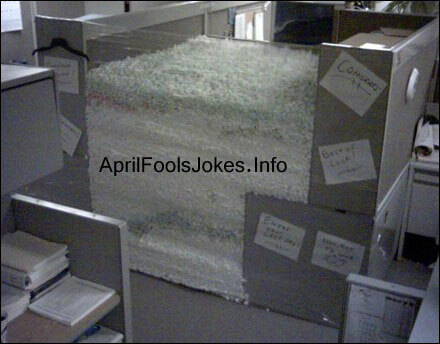 Foil Everything: This office prank should be performed in small offices or in an ofice where a lot of people are willing to gang up against one particular co-worker. Here's how it goes - buy several restaurant-size rolls of aluminum foil. 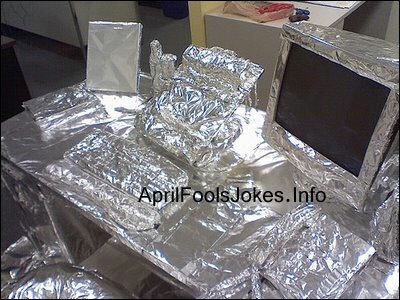 Wait 'til the "victim" leaves for the day on March 31 then go into their cubicle or office and wrap EVERYTHING in foil: desk, chair, computer, books, pencils, etc. If enough people chip in and help, it won't take too long. Be sure to take lots of pictures! Drawer Madness: Remove the desk drawers in the persons desk and switch them around. If you cant remove the drawers, just take out the stuff and swap it around, move it all over the place. They'll look for stuff where they know it should be and can't find it there. Free, 'Fresh' Donuts: Buy a box of donuts a few days before April 1st. Keep them at home in the refrigerator with the top open until they are very dried out. Bring them to the office on April Fool's Day and put them by the coffee maker so everyone will help themselves to the free 'fresh' donuts. Cheese sandwiches: Make a dozen or so cheese sandwiches for your co-workers. Keep the wrapper on the cheese slice. When they bite into it, they'll get a nice surprise.